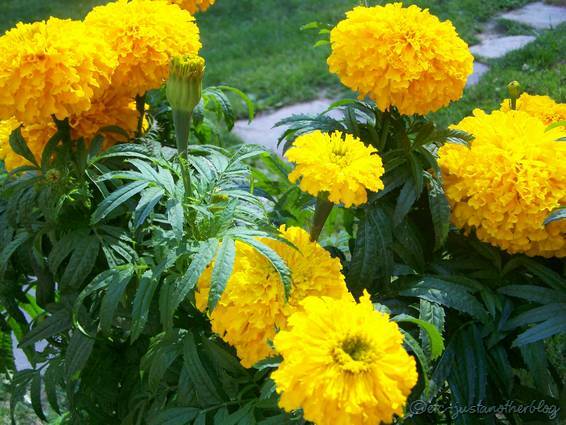 I have a large flowered yellow marigold in a big container by my steps.. the plant is huge and was beautiful, one of the prettiest marigold plants I’ve seen, up until a few days ago. I noticed the foliage had a dull, bronzed, “burnt” look– as if the plants were suffering from a serious lack of water. I’ve watered this plant regularly, so I knew it wasn’t lacking in that. I’ve also been diligent in deadheading, and in fertilizing it weekly. So I started looking a little closer at the plant itself, and noticed that each individual flower was completely covered with a fine webbing, like a thin, very tight spider web, stretched completely around each flower. These webs were also visible in spots throughout the undersides of the thick foliage. On closer inspection, I noticed literally -hundreds- of tiny little moving red dots. Spider mites. Yuck. 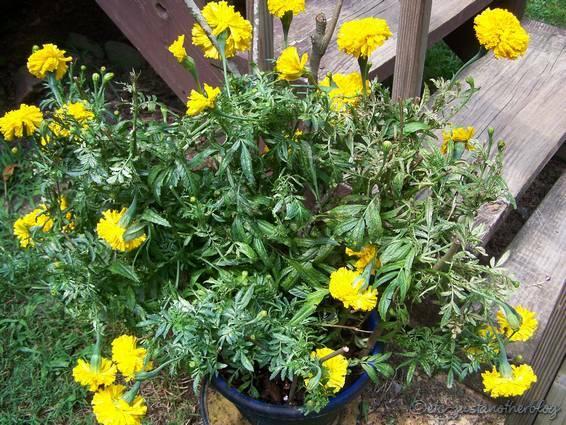 In only three days time, my gorgeous big marigold has turned into a bronzed, burnt looking droopy mess. It looks like crap now. After reading what I could find out about these pests on the internet, I don’t think these things are going to be easy to get rid of, and I think I may have caused it, or at least contributed to it. Right behind this plant, I have two hardy hibiscus plants, one on either side of my front steps. These large bushes suffer damage every year from some sort of small worm that eats holes in the leaves. This year, I was determined to get ahead of these pests, so I’ve dusted the hibiscus bushes with a pesticide dust two or three times in the past couple of months. I have no damage to the leaves of the hibiscus, and no sign of the worms, but now I have the spider mites. According to what I read, this dust kills the natural predators of these mites– ladybugs, lacewings, and beneficial mites.. so it seems that possibly my use of this dust, along with the hot weather and severe drought conditions in our area has caused the spider mite population to explode and thrive. 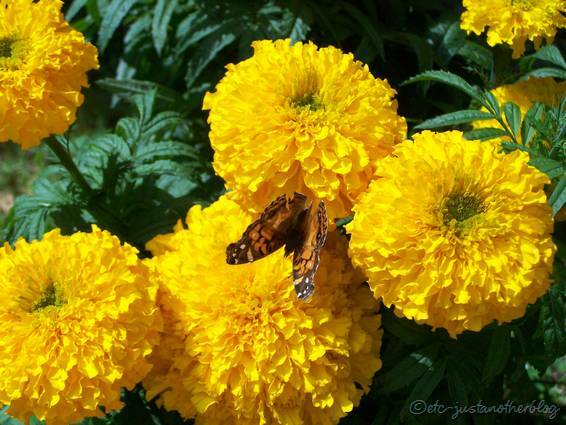 On my marigold plants. 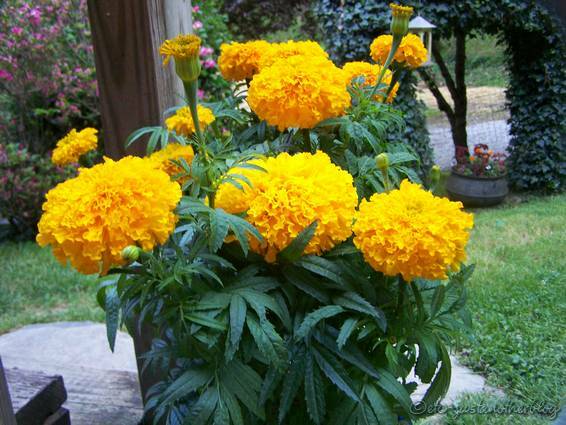 Since a soap solution is supposedly only about 40-50% effective in controlling spider mites, I may just have to get rid of the marigold pot completely, before the mites spread to something else. I’m not sure of course, and maybe it was just a coincidence that after using the pesticide, the spider mites appeared… or it could be just the extremely hot weather conditions and the severe drought in my area for the past several months… I don’t know. I do know that I’ve never had these mites before. Updated to add: I bought some pyrethrin and some insecticidal soap today. 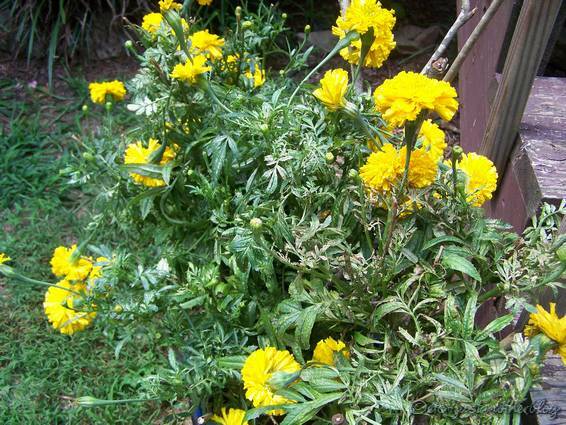 We’ll see what happens; in the meantime, I’ve moved the marigold pot out of the yard and far away from my flower beds. Update: although the insecticidal soap didn’t work, the pyrethrin seems to have gotten rid of the pests. I cut the plants back, but am not sure they will recover. 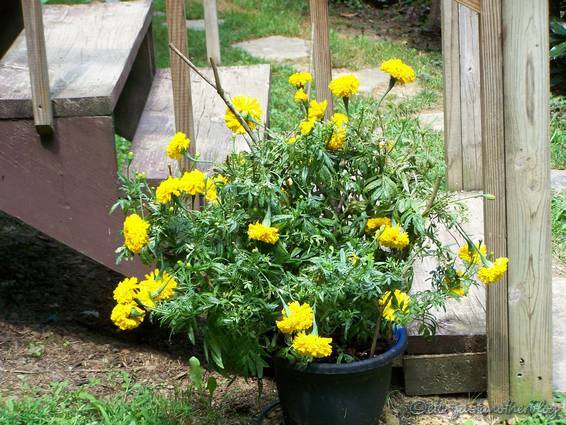 Update, September 9: Although the pyrethrin did kill the spider mites in this particular container, the marigolds never fully recovered from the damage and had to be discarded. The spider mites also had spread to another large container nearby, this one with impatiens. I cut them back severely, laid the pot on it’s side and then sprayed the plants several times with a -strong- spray of water, making sure to spray the water onto the undersides of the foliage also. After the plants dried, I sprayed them lightly with the rotenone spray and waited a couple of days before moving the container back onto the porch. These plants did recover and are doing fine and have grown back to their original size with no further problems. I haven’t seen any more of the mites since. Next year, I’ll be more diligent in watching for these mites to start, and will spray the plants down with water at the first sign of the mites, and will use the rotenone spray. The mites can definitely do a lot of damage, and can absolutely ruin nice healthy plants. All photos here are clickable for larger versions. Good luck with the solution…I’m sorry you’re having to deal with this annoying problem. However, this is an incredibly informative post — it’s amazing how interconnected everything is! Thank you, inadvertengardener. Yes, it is amazing how interconnected everything is. 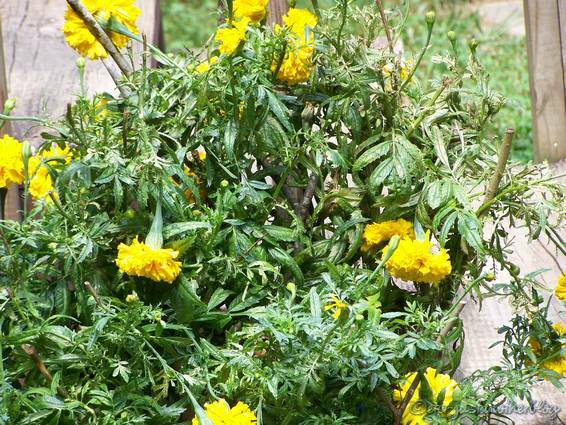 These spider mites have absolutely ruined this container of marigolds.. and so far, the soap hasn’t made much of a difference. I’ve cut the plants back to just a couple inches and will see what happens. I think it’s probably too far gone to worry about now anyway though. But, on the bright side, I’ve learned something and that is that I need to be far more careful using Sevin dust… I would much prefer the holes in the hibiscus leaves to these destructive mites! thank you! I’ve been searching the net for over an hr trying to figure out what was making all of those webs in my beds. I first noticed on the thyme a few wks ago. 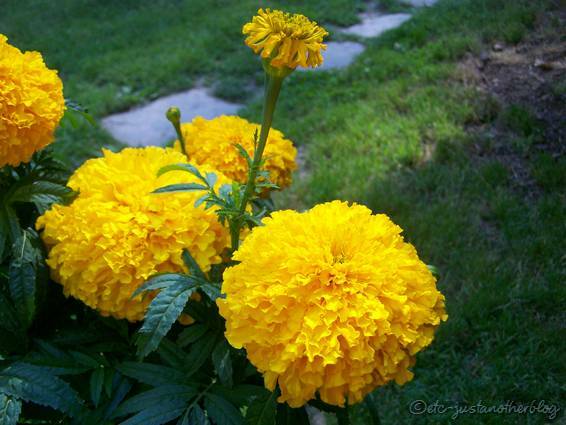 tonight I noticed that it had almost all of the self sown marigolds. tomorrow they get pulled out to save the perrenials. but I am confused now. it’s too big for insectical soap. pyriehin or rotenone? I’ve never heard of the later. we’ll see what the local garden shop has. My herbs are already harvested, so if I break my own rules of using herbicides they will be gone by next year’s harvest & my perrenials will be saved! Thank you ever so! I’m glad the post helped. Good luck getting rid of the spider mites! I haven’t had a problem with them this year, thank goodness. Thanks for leaving a comment. Thanks for the tip, Cory. I’ll definitely keep the liquid sevin in mind. They’ve been really bad this year here as well, we’ve had some success at getting rid of them with two sprays of a Bayer miticide product. They sure are nasty insects and can totally ruin even huge butterfly bushes. They seem to thrive in our extremely hot and dry weather. This iteration comes dressed in a Sail and Metallic Red Bronze color scheme. Featuring a tonal leather upper, debossed tongue logo with its signature Wings logo on the heels. It main design feature is its stitching pattern above the midsole.